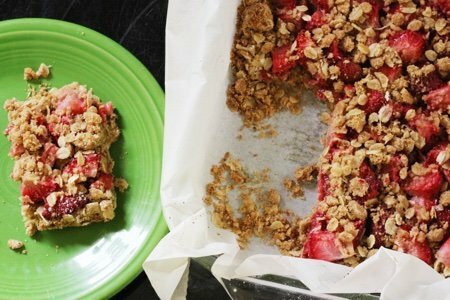 This healthy strawberry oatmeal bars recipe with become a favorite in your house. I know I go strawberry crazy this time of year! I already did an easy strawberry shortcake cupcakes recipe and a list of the best strawberry recipes for spring. I just can’t get enough of them when they show up! They are right in the front of the store when I walk in and they make it into my cart every time I shop. I don’t worry about organic (though sometimes the organic is the same price and I buy it) because the health benefits of eating fresh fruit far outweigh any risk of pesticide exposure. When I buy organic, I buy to support the environment but I do wish I could afford it all the time. I challenge you to see if you don’t have any of the above ingredients in your pantry RIGHT NOW. You might not have the ground ginger (but you don’t need it). You can substitute ½ white flour and ½ wheat flour if you don’t have white whole wheat flour on hand. You can make this recipe and you will be so glad that you did. I know that it uses butter but there isn’t that much of it and there really is no substitute for butter in baked goods. I have tried everything – canola oil, coconut oil, avocado, buttermilk…. and NOTHING tastes as good as butter to me. You have to give me a little credit for trying. 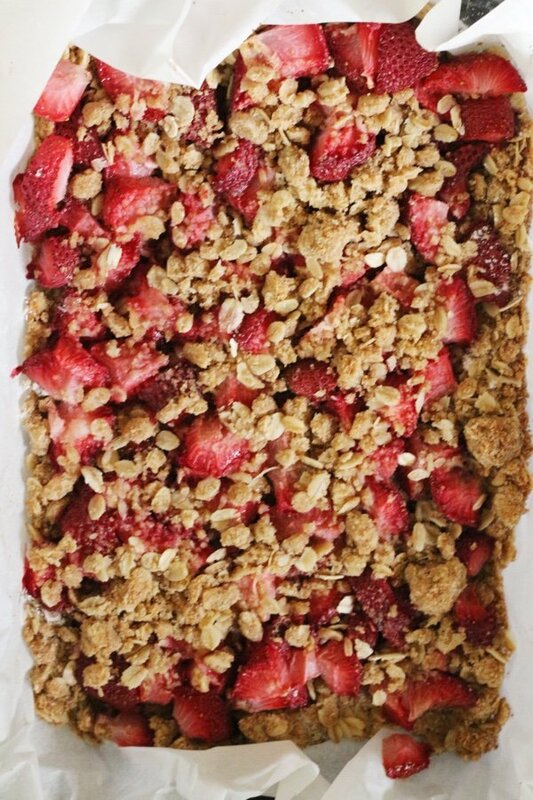 All you do is make the crumble and toss on the strawberries and bake. The recipe only needs one bowl (so easy clean up!). 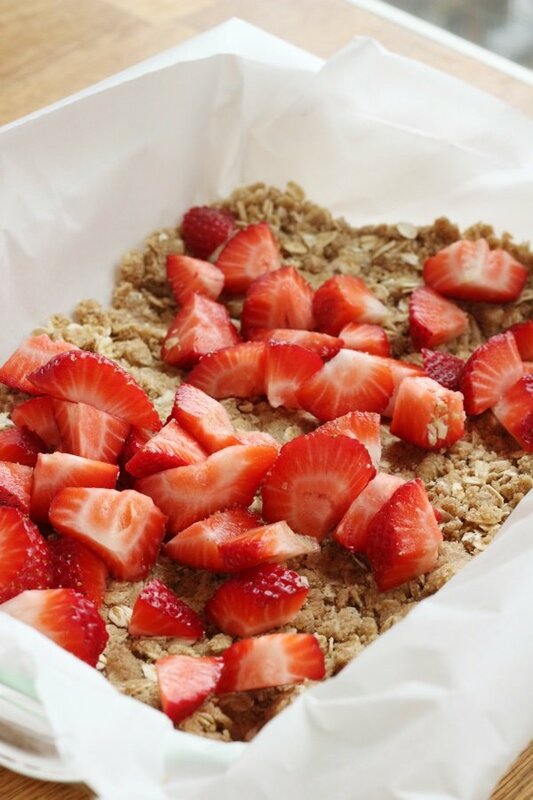 I love the crunch of the oats with the soft strawberry texture. Yum! How do you eat strawberries this time of year? Do you buy organic? Line a 11x7 casserole with parchment paper. Heat oven to 375 F. In a medium bowl, combined oats, flour, sugar, ginger, and salt. Mix in melted butter and mix until a crumble forms. Reserve ½ cup of crumble and press the rest into the casserole. 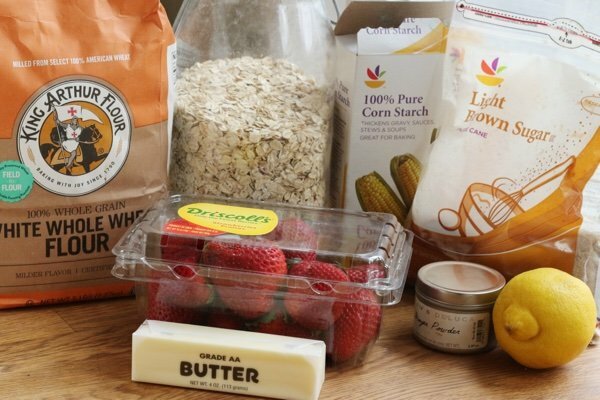 Add half the strawberries and sprinkle with corn starch and 1 teaspoon sugar and squeeze the lemon slice over the berries. Add the rest of the berries, sprinkle with sugar and the ½ cup crumble. Bake for 30-40 minutes until the crumble is slightly browned. Allow to cool and slice into squares. I pick and choose what I buy organic. The Environmental Working Group publishes a "dirty dozen" list each year to show the top 12 pesticide laden foods. I try to buy these in organic as often as possible. They also print a "clean 15" in which they conclude there is no reason to buy organic. Strawberries are actually at the top of the dirty dozen. Regulations need to be way more strict in the US! Also FWIW - Driscoll's workers called for a boycott last year over terrible working conditions! Boycott is still on as far as I can tell (https://www.facebook.com/BoycottDriscolls/). So organic or not, worth considering avoiding Driscoll's! I totally agree on the butter for flavor. Last week I put together a banana nut muffin batter only to find my nut supply had vanished [visiting daughter got at them?] so having already subbed applesauce for butter, I just went ahead and baked them nut-free. Talk about blah-tasting! I had to slather them with butter after the fact. This crumble looks like another yummy Snack Girl recipe, healthy and easy too. Regarding organics, I would like to mention that its been reported strawberry crops are the no.1 pesticide-ridden fruit in the USA. And, I'm in complete agreement that offering both non-organic and organic is desirable for the general public to choose. Personally, I've reckoned with the extra $ for strawberries [and certain other produce]. In CT it's usually $1-3 more per quart. I'm fortunate to be able to offset this with frugality in other areas. I don't judge others for their choices or needs but just think it's nice to arm people with available current research. As an old bird who remembers wistfully when all food was organic I think it's a crime that profit and greed has bought our food protectors, namely the USDA. I'm under no illusion that organic is truly organic but hope its a bit better for me and my family. I also kinda like being called crazy, its served me well for 69 years :) Happy strawberry baking! I love to bake and freeze breakfast items. Do you know how these hold up with freezing? Be sure to pay attention to the pan size on this. I made it in a 9 x 13 metal pan, and the bars didn't set up. But they are delicious, even if I have to eat them with a spoon! I'll pass on organics. Last time I brought home sweet potatoes, I had bugs boring into them on my counter. I'd rather have pesticides! I buy organic whenever possible, particularly produce on the Dirty 12 list, because I have seen the amount of spraying in my area and don't want to eat food with the pesticides on it. I doubt we are pesticide free but I can at least reduce the amount. To replace the white whole wheat flour - do you mean 1/2 cup white and 1/2 cup of wheat flour OR use the two flours to make a total of 3/4 cup (as listed in the recipe for white whole wheat flour)? @JoAnne - Yes, this will hold up to freezing. @Kerri - I meant use both flours to make 3/4 cup. Thanks for your helpful questions! !